Back by popular demand! Join us at the highly rated Islantilla Golf Resort for our Christmas and New Year programme. 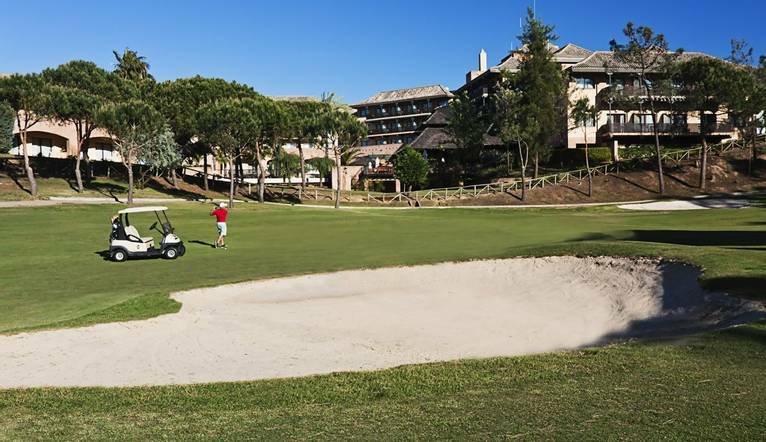 If you like the idea of staying in a good quality hotel, with a 27-hole golf course right on your doorstep, then the Islantilla Golf Resort is a great choice. The resort’s excellent 27-hole golf course sits right next to the comfortable, friendly hotel, where our Golfers are always very well looked after. A firm favourite for Solos, and the perfect venue for our Christmas and New Year programme, which we are sure will be a fun and sociable week. Set within a pine forest, and with impressive sea views, the 27 holes at Islantilla give players the opportunity to play 3 different 18 hole combinations. There is a good variety of holes featuring fast greens, narrow tree-lined fairways and tricky over-water shots which will appeal to all levels of golfer. The three nines meander through the pinewoods and many holes enjoy spectacular views of the Atlantic. Holes 1 to 9 are hilly with a few blind shots; Holes 10 to 18 are undulating with hanging lies to be expected; Holes 19 to 27 are long but not overly difficult. There are also excellent practice facilities at the resort. The resort’s wonderful location and layout means that you will still have plenty of time after your morning round of golf, to spend the rest of the day relaxing by the pool, or down at the wonderful beach at Islantilla which is a 20-minute stroll away. There is also a small shopping centre nearby where you can find some bars and restaurants, and the hotel itself has its own “English” pub which is a great spot to enjoy an après-golf drink or two in the evening and discuss the highs and lows of the day. This stylish hotel offers good quality accommodation in a relaxed environment. Rooms feature satellite TV, minibar, safe, (extra charge), telephone, hairdryer, air-conditioning, terrace or balcony. The transfer time from Faro Airport to the Hotel Islantilla Golf Resort is approximately 1 hour, depending on weather and traffic. 5 rounds of organised golf: 5 x Islantilla Golf Course.